The Elks Lounge at 114 N. Broadway has been completely redecorated over the last couple of years. We are very excited about the new look and invite you to come and visit, and bring the children. We have bingo facilities, plenty of seating, big-screen TVs, and a fully-stocked bar, including draft beers brewed just down the street at Red Lodge Ales. Our hall is available for rental, either along with the kitchen and dining area or separately. We have a fantastic dance floor, piano, tables, chairs, and other amenities as well. 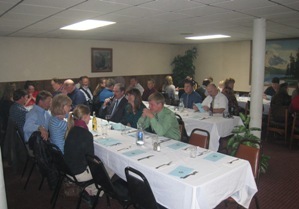 The Elks is a popular spot in Red Lodge for wedding receptions, reunions, funerals, and more. Our downstairs dining room includes a complete kitchen facility. You can rent out the whole floor, the whole building, or just what you need for your event. We can comfortably accommodate up to 250 people. We are currently working on renovating the old downstairs bar and turning the western part of the downstairs into a handicapped-accessible veteran's rec center.